How would you run code against multiple CF versions at once using IIS on XP? If you use IIS on XP, have you ever wished you could put your code in one directory and run it against different versions of CF, easily. In this note, I show you how. Someone asserted on a list that some code failed as of CF8, but I tested it against 8, 7, 6, and 5, and it worked the same in all. Hearing that, someone else asked, "Charlie, are you running all those on the same machine or on vmware?" I assume that the reader, like many, is using IIS on XP, which doesn't let you have more than one web site, which might seem to make it impossible, though some may know the tricks I'll mention. Of course, folks running on Apache, or IIS on Win2k3 or Win2k Server, would just say, "create different web sites, and install each CF version into a different web site". Fair enough, but how do you solve this using IIS on XP (or Wink2 workstation), if you can't have multiple sites? That's what I explain below. Before I go on, though, let me make an important for those who may not be aware: you certainly can run multiple versions of CF on a single machine. They each get installed in their own directories, with their own JVM (as of CF6). The challenge is just to avoid port conflicts and external web server conflicts. But why not just use the built-in web server? Sure, if you use the built-in web server available in CFMX since 6, then you can indeed run multiple CF versions each with their own web docroot without conflict. But that's not the point here. That would cause each CF instance to have its own wwwroot, and you'd have to put your code there to run it on that version. And I have even explained in a recent blog entry that you can get around that using virtual mappings in the JRun web server, pointing to the shared document directory. But sometimes you really want to use IIS for some reason, or you just don't want to have to remember to use the right port and virtual directory name configured for the built-in web server. Yep, some will want to note that you can indeed create multiple web sites in XP, if you use the right tools. I've written about such tools before. It's just that you can't run them at once, so you have to enable/disable each time you want to run the test. To me, that more of a hassle than just doing the one-time configuration which I discuss below. So how do you configure things using IIS on XP? OK, I hope I've headed off complaints some may have. Oh, well, I should add one more: what I'm about to show you is definitely not supported by Adobe. Some might even argue against doing it. Certainly, if you have problems with things while trying to work this way, they're going to tell you to use a vanilla setup. Still, it's worked for me for years. In fact, I first wrote about it in a CFDJ article back in Sep 03 (co-authored with Jeff Houser). That was written in the timeframe of people moving from CF5 to CFMX and wanting to set things up this way, but the concept still applies even for those moving from 7 to 8, or 6 to 7. It also mentioned using the same approach for running against BD as well, which means it would apply also to Railo and Smith, etc. Finally, since writing that article, I've also realized a few things I could have added to the article, which further motivates me writing this entry. So, as explained in the article (which shows you the actual steps in IIS), I configure different IIS virtual directories called _cf5, _cf6, _cf7, and _cf8. I set each to points their CFM extension (and related CF ones) to the appropriate web server extension that would be used if I'd configured each server to work with IIS (like C:\CFusion\BIN\ISCF.DLL for 5, C:\CFusionMX\runtime\lib\wsconfig\1\jrun.dll for 6, and so on). More important, I have them all point at the same, single document root (in my case, c:\inetpub\wwwroot). That allows me to then run code in that single directory against different editions, using a url like http://localhost/_cf5/somefile.cfm, or http://localhost/_cf7/somefile.cfm, or the default http://localhost/somefile.cfm goes against CF8. Note that you must run the web server connector for each CF edition from CFMX and above, since it only builds those jrun.dlls (I mentioned above) if you do that. See the CF docs ("Installing and Configuring ColdFusion" to learn how to run that, even after CF is installed, if you installed it using the built-in web server instead. Before you do, though, as explained in the article, be sure to save off the path to the DLL for .cfm file extensions, as running the configuration tool will wipe over the previous path. There's something else to take note of about using the CF Admin (/cfide/administrator/index.cfm) when you set things up this way. It has to do with whether, when you install each version, you tell CF to install using the built-in web server or using IIS. In the former case, CF will put that version's CFIDE directory (and all its related files) into the wwwroot for that built-in CF server, such as c:\coldfusion8\wwwroot\ for CF8, or c:\cfusionmx7\wwwroot\ for CF7. In the latter case (if you tell CF during installation to use IIS), then CF will place those files into the IIS docroot you name. Assuming you would always choose that c:\inetpub\wwwroot directory, that means that its CFIDE directory will be replaced with whatever is the last CF version you install. And that means that even if using the virtual directories above, they'll all point to the last CFIDE version, which won't work (the CF Admin can only run in the version for which it's created). Either way, you can solve this by creating yet another virtual directory, for CFIDE, inside the version-specific virtual directories above. So if during the installation of 6, 7, or 8 you told CF to use the built-in web server, you'd point the new CFIDE virtual directory to the builtin web server's CFIDE. For my _CF6, for instance, I'd create a CFIDE virtual directory within that to point at c:\cfusionmx\wwwroot\CFIDE. If instead you choose to install each version using IIS, then just as you needed to save off the file extension's path to the web server DLL, you would similarly need to remember before each install to save off a copy the CFIDE directory for the previous release. This is especially key for CF5, since there is no concept of a built-in web server for that. Back when I installed CFMX 6, before doing so, I copied the CFIDE directory to call it CFIDE5 instead. (Sure, you could do a rename, but only JUST before you installed, in case you need it.) Then I created the CFIDE VD within the _CF5 VD to point to that. 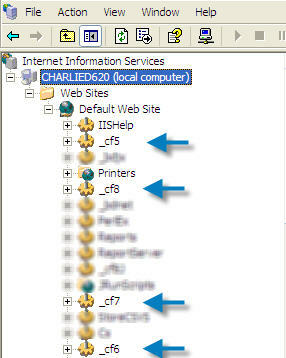 It may be worth noting here that if you do install CF 6/7/8 using the built-in web server initially, and then use the web server configurator tool to then connect them to IIS, that does not move the CFIDE from the built-in web server root to the IIS docroot. So again you will need to point your CFIDE virtual directory to that CFIDE in the built-in web server. Why not just use the built-in web server for the CF Admin? Of course, you could just use the built-in web server to access the Admin instead, even if you are otherwise running code via IIS. And going back to the original writer, you could indeed also do this using VMWARE. (I've written about how versions of it and Virtual PC are now free.) It might be overkill, though. Again, you don't need to worry about running multiple versions of CF on a single server. It's all just about avoiding port conflicts and potential external web server conflicts. That's what this has been about all about: how to run all your code via IIS against multiple version of CF, all from a single directory. Did this help you? Let me know. Did I forget something? Got a complaint? (People seem to love that opportunity. Go for it.) I hope it has helped some of you. It's certainly helped me, and others who I've shown it to. If you never paid much attention to the hubbub about SMS gateways when they came out in CF7, you may have missed that there is an available SMS Test Server and even a client (phone) simulator for working with this feature, both built into CF7 (and 8). You can learn more about these at the URLs below. But I want to pass on a tip about something that tripped me up when I first tried to "play with" the new phone simulator. I would launch the SMSClient.bat file (in the cfusionmx7/bin directory), and a DOS window would open (and stay open) but I'd never see the simulator. I finally figured it out: you need to have started the SMS Test Server (done in the "Event Gateways">"Settings" page in the CF Admin). When pressing enter on an input text field will suddenly not submit the form...sure surprised me! Most know that a form will submit if you press enter while the cursor focus is on a text field (INPUT TYPE="text"|"radio"|"checkbox"). Some have surely noticed that you don't often even need a submit button, which can be nice when creating some simple interfaces. But did you know that the submit will not happen if you have two input text fields (and no submit button)? I found this when I had a long-working form of this sort, to which I added a second input field. Suddenly, it stopped submitting on pressing enter. I've tested this in either IE 6 or Firefox 2. I explain the scenario and a solution, below. Again, the key is that I have no submit button in this scenario (as it would just look clunky, and is otherwise unnecessary). So I did some digging and found that indeed others have observed this. One suggestion offered was that you provide a submit button but use CSS to make it invisible. You can't really use "display:none" because then, in IE 6 at least, it still thinks it's not there. If you're curious about the empty action, that just makes the page self-posting. If you're interested in that, or have any comment on that aspect, please see my other blog entry on the subject. Well, I have to report some news since learning of this and posting about it. It turns out that this approach has the unfortunate side-effect that it makes your note go out as "from" your gmail account--even if you sent it as "from" another account in your mail client. That's a real bummer. Again, perhaps better than nothing, but not what I'd expected. On the surface, it may seem only a nuisance. If you read your gmail mail with your mail client (via POP), then you may not even notice this. But I did notice that the "to" address on replies sent while using this was my gmail address, which is not what I'd expected. And I just checked, and indeed the recipient also sees the email as coming to them "from" your gmail account. If either is a concern, then be aware. There is a real gotcha, though, if you reply to a list. I had a note from a list that came, as expected, "to" my carehart.org address. When I replied, it would normally go back as "from" that address, which is the address on file at the list. But this change to the gmail address meant the note now went from an address not on the list. Some lists will bounce such notes, so you'll now it's happening (and now you'll understand why). But this list is one where if you send a note from a non-subscribed address, it just ignores it--so the note never got to the list. Only now did I connect the dots. Forewarned is forearmed! You may not want to *always* do it, but when you're stuck in a hotel and need to get mail out, it's a blessing. I learned of it while traveling at the WebDU conference in Australia and after the conference was staying in a small hotel that was blocking my email. i couldn't get their smtp server address to use instead (more on that below), but using gmail as the smtp server worked! Here's the blog entry that clued me into the solution. Many thanks to him. As for how to configure your mail client to this up, the blog entry above gives the basics. You just want to change the SMTP (outbound) setting to use smtp.gmail.com, and port 465 (telling it to use SSL). You also want to configure the login authentication (for sending mail only) to be your gmail account. If you're really not sure how to change your mail settings, this trick may be above your level. But I will point out that Google themselves offer a page of info showing how to configure your mail clients. Just note that it's showing how to setup the client to both send and receive gmail. This trick is JUST about setting up to send email via gmail. Don't delete the incoming (pop) mail settings in your email client for your mail connection. One last point about the option above: you do need to configure Gmail to permit POP access, as discussed here. But note that you don't HAVE to use pop (meaning a mail client) if you prefer to keep reading gmail via its web interface. If you never connect via pop, it will still be accessible via the web. Also, notice that even if you do collect it via pop (as I do), there's an option there to keep the mail in Gmail's inbox, if you prefer, so it's till always accessible via the web (though the web interface has no way of marking mail you read on your mail client). Get the hotel (or ISP) to tell you the name of the mail (SMTP) server they prefer you to use, and use THAT in your mail client. Sadly, it's not always possible to get that from the hotel or client staff. Use a webmail interface instead. There's almost always one provided by your email provider, and beyond that there are tools that will serve to do it for you even if yours does not (like www.mail2web.com). But I much prefer to have all my mail (in and out) saved in my mail client, both for archival and searching purposes. Use a 3rd party mail relay service, like smtp.com and smtpanywhere.net. If I hadn't found the gmail solution, I was about to do this. Couldn't find any that are free. Use a tool like JiWire HotSpot Helper, which does mail relay and more (like enabling secure email login and transmission, which is more important than many realize), but it's not free (there is a free trial). Use SSH tunneling, as discussed in a nice write up. Unfortunately, I tried it and my mail host doesn't support it. I've asked them. If there are any other solutions I've missed, please do share. Hope this helps someone.